Tenerife Weather Alerts and Carnaval – they’re like love and marriage. Anyone who knows the Canary Islands will affirm that Carnaval (carnival) and bad weather are inextricably linked. So when the Spanish Met Office showed the island this week – Carnaval week – to be on orange alert status, no-one was really too surprised. Thankfully Opening Night Parades (where they actually happened…) passed off without weather incident but Sunday night was a bit of a wash out here in Puerto de la Cruz and lacking a Paddington Bear outfit, I didn’t bother venturing down to the Plaza. But after a damp start, Monday turned bright and sunny and the traditional Monday night party looked good to go. Tuesday is the Gran Coso Apoteosis (closing) Parade in the capital city of Santa Cruz and so naturally, the entire island is given a Public Holiday in order to attend (this is a very civilised island as far as workers are concerned and Public Holidays are declared at the drop of a sombrero). Consequently, the Monday night street party is usually one of the best. We’d heard reports of bad weather starting to come in from other parts of the island during the evening; strong winds mainly with some early reports of heavy rain, but here in Puerto de la Cruz we set off to walk the 3km into town at around 11.30pm beneath clear, starry skies in a balmy 21°C, sweating considerably by the time we reached Plaza Charco. 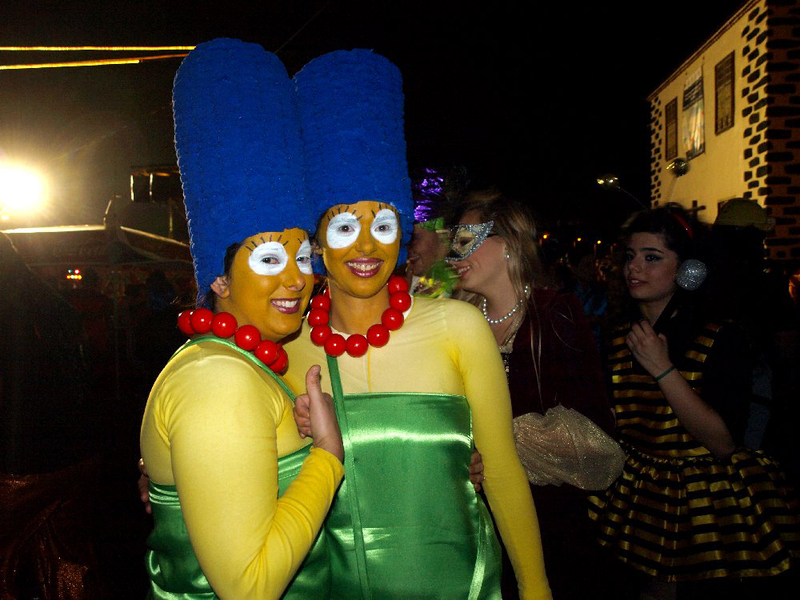 Marge Simpson and her twin sister, out on the town without Homer...d'oh! Despite fewer numbers than in previous years, the atmosphere was buoyant and the standard of costumes was, if anything, better than ever. Almost entirely absent were the all-in-one Dalmation costumes which have dogged us (ouch!) for many years, particularly amongst the young. There were fewer gangsters too and those that did wear the black trousers, white T shirts and braces, added some excellent facial designs to lift the effect. Pirates were still strongly in evidence but the authenticity of costumes (well, Hollywood style) was very high. My favourites amongst the rest of the highly original, witty and professional outfits were the N’avi, who looked nothing short of sensational; two Marge Simpsons and Shrek and Fiona – all incredibly authentic looking. Somewhere around 3am/3.30am – it’s difficult to be exact, time has a way of skipping continuity at the Carnaval street parties and you can lose entire hours amongst the madness – we noticed that the breeze was starting to pick up. By 4am it had turned into a decent wind, gusting plastic beer cups and debris all around the harbour. The gusts grew stronger and the atmosphere took on a hurricane party feel with groups of revellers climbing onto the wall of Casa Aduana and dancing into its headlong blast. A male Marilyn Monroe who had spent the entire evening swishing up his dress to reveal his underwear suddenly went into reverse mode as he reproduced the famous ‘Seven Year Itch’ scene to brilliant effect. The atmosphere took on a distinct 'hurricane party' feel - madness. At around 4.30am we left the party and headed home. As soon as we moved away from the coast the wind dropped and we were back into sultry, still, clear night that left us once again sweating by the time we reached home. Lengthy make-up removal meant that it was 5.40am before we finally got to bed and at 7am I was woken by the sound of the wind howling around the house and sending debris from the trees smashing against the patio doors. By 7.30am all was once again still as the grave. When we finally dragged ourselves out of bed at 10.30am, it was to clear blue skies, unbroken sunshine and barely a flutter of a breeze but reports showed that much of the rest of the island was being lashed by heavy rain and strong winds. The orange alert remains in place for the foreseeable future; of course it does, it’ll be here as long as Carnaval is.